The Richard J. Daley Library has an extensive collection of print aerial photographs of Chicago and the surrounding counties. 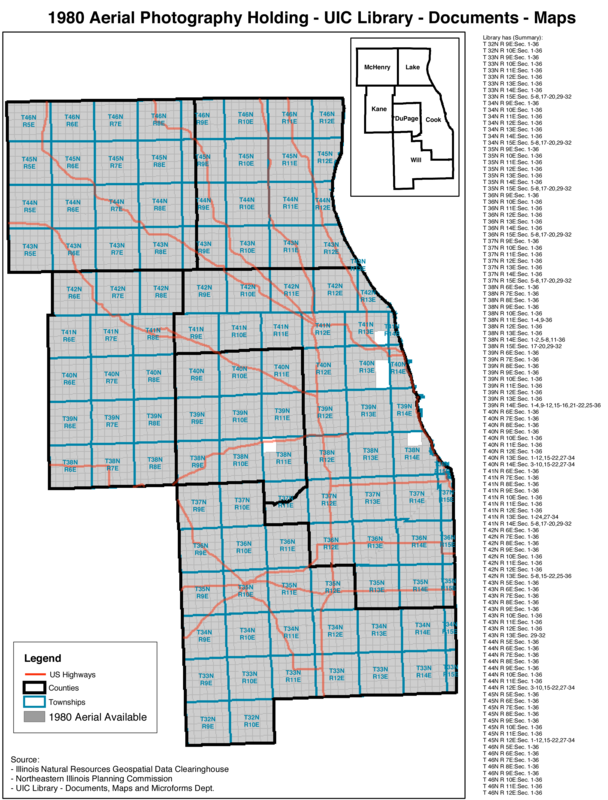 Publicly available are City of Chicago Department of Development and Planning 1968, 1973, and 1994 series, as well as the Northeastern Illinois Planning Commission (NIPC) 1980, 1990, and 2001 series. Also available are digital files of 2002 and 2005 U.S. Geological Survey (USGS) orthographic aerials and 2004, 2005, and 2006 National Agriculture Imagery Program (NAIP) images. These require that you contact the library at lib-maps@uic.edu and arrange an appointment for copying the files. Aerial Photographs that are available will be listed in the library catalog. The City of Chicago Department of Development and Planning aerial photographs cover much of the city of Chicago. The aerials are large paper prints (about 60 x 60 cm). The scale is roughly 1:3,050, please refer to the scale on the sheet for an accurate scale. Use the index maps linked below to determine the sheet number(s) needed. The spring 1968 and 1973 aerial photographs are organized by flight index number or sheet number. 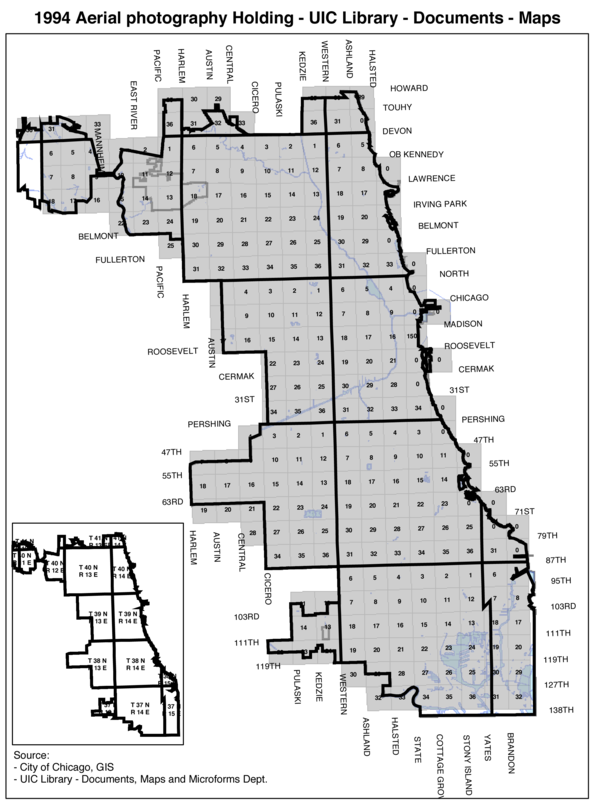 The Northeastern Illinois Planning Commission (NIPC) aerial photographs cover Northeastern Illinois, including Cook, DuPage, Kane, Lake, McHenry, and Will counties. The aerials are large paper prints (about 77 x 77 cm). The scale is 1:4,800 or 1" = 400', please refer to the scale on the sheet for an accuracy. The aerial photographs are organized by Township, Range, and Section(address guide here). Each sheet covers four sections. Use the index maps linked below to determine the section(s) needed. Aerial imagery online can come in many different shapes and sizes. Formats range from JPEG, JPEG2000, TIFF, GeoTIFF, PDF, and GeoPDF requiring no special software to view, to files, such as MrSID, requiring additional software to view and manipulate. This guide focuses on those resources that do not require special software to view. 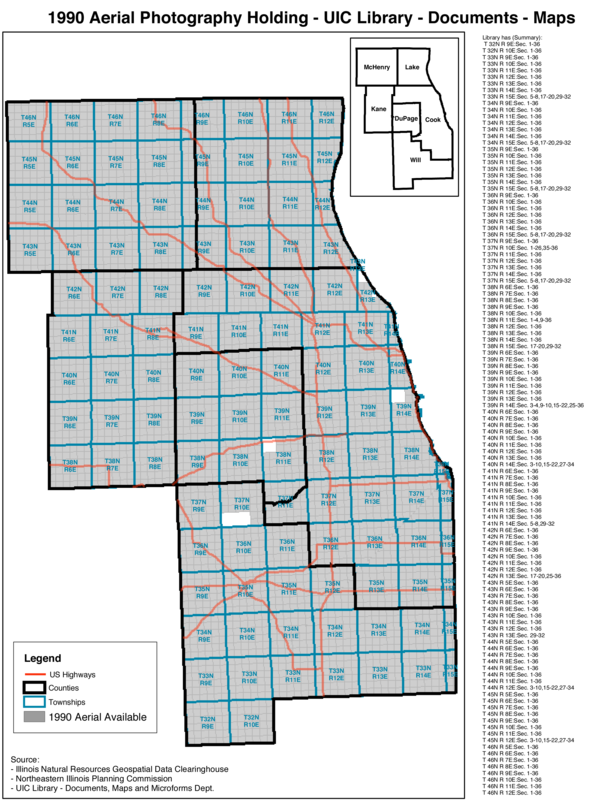 Access Illinois GIS data sets and documentation (metadata) for ArcIMS Interactive Map Services, USGS digital topographic maps, aerial photography, orthoimagery, orthophotography, geology, land use, natural resources, and infrastructure. 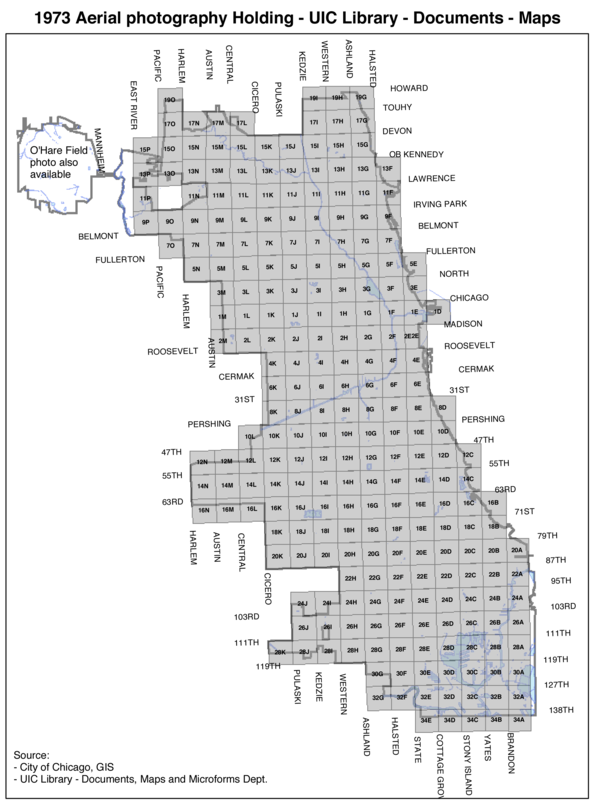 Illinois data sets and map data layers are available for download free of charge. Images available in JPEG, TIFF, and MrSid formats. As part of the Illinois Historical Aerial Photograph Data Archive project, airphotos were scanned and made available online. Statewide airphotos, including 1938-39 Cook County airphotos, are available for downloading and viewing online. Selected images from the CAPS collection have been digitized and are available to view online. The photographs are of the Chicago area, though there are some images from other areas of the state. Images available to view. Registration is required to download. Query and order satellite images, aerial photographs, and cartographic products through the U.S. Geological Survey. Enter search criteria or click the map to select a place (Shift+Click+drag will create a selection area). Click the "Data Sets" pane and select the types of aerial imagery to view. 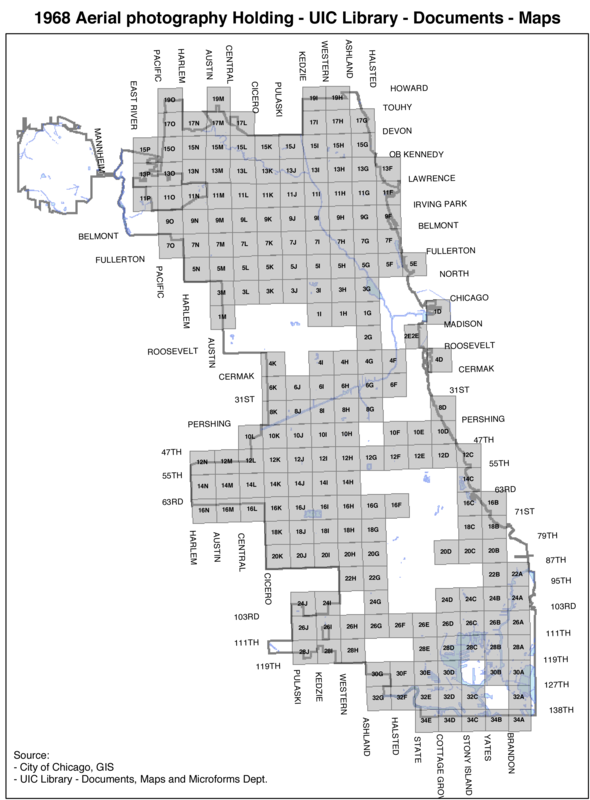 Click the "Results" pane to view available imagery for the area. Use the drop-down menu to toggle between the different data sets and view the results. Requires an email address to receive download links. Select “Imagery - 1 meter” and/or "Imagery - 1 foot" in the “Overlays” tab of the left pane. Use the search box at the top or navigate to the area of interest on the map. Select the "Download Data" tool in the toolbar and click on the area of interest. To download images, click “Download” beneath the quadrant name in the “Selection” tab of the left pane. Select “Orthoimagery” and click Next. Select the images of interest and click Next. The “Cart” tab of the left pane will now be visible. From there, items can be previewed, added, and removed from the cart. Click “Checkout” and enter an email address with which to receive the download links for the requested maps. For additional assistance, check out The National Map Viewer Quick Start Guide. This 1997 guide is a good archived guide to historical aerial photographs. While it is no longer updated, the historical information is extensive.